If you don’t want to know who the villain is in the upcoming Iron Man 3, please stop reading now. There are SPOILERs ahead! At this weekend’s panel for Iron Man 3, director Shane Black let a major piece of news slip–the identity of the villain in the upcoming sequel. The sizzle reel for the upcoming film showed new armor for Iron Man and then ended with Ben Kingsley dressed up as a character wearing ten rings. It was then confirmed that Kingsley is playing the Mandarin in the upcoming film. “Ben Kingsley is going to be great … as the Mandarin,” Black said. 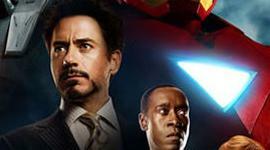 As for the future of the series, actor Robert Downey, Jr. said that he and Don Cheadle’s contracts are up after the next installment. I’d rather see them keep the Avengers going – I think there are more possibilities for fresh stories with an ensemble cast…not to mention the Scarlett Johansson effect! I prefer Iron Man and Thor. Both the main characters along with Loki and Hulk stole the show in Avengers. The rest of the superheroes were just boring.